Édouard Lantéri , a sculptor and medallist, was a native of Burgundy, and initially trained under Aimé Millet (1819-1891) and M. Lecoque de Boisbaudran. He continued his studies at the École des Beaux-Arts under Eugène Guillaume (1822-1905) and Pierre-Jules Cavalier. Lantéri settled in England from 1872, and was naturalised in 1901. At the age of 23 he became chief assistant to Sir Joseph Edgar Boehm, a position he held until Boehm’s death in 1890. In 1874 Lantéri was appointed Master of Modelling at the National Art Training School (now Royal College of Art), and in 1900 became the first Professor of Modelling. 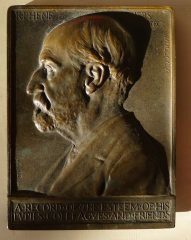 During 1905/6 he supervised students working on the figures of Fame, Sculpture and Architecture for the Exhibition Road façade of the Victoria and Albert Museum. Lantéri wrote a three volume guide to modelling published in 1902, 1904 and 1911.